There has been a heated debate on whether to use a twin bore or single bore subway for BART's extension from Berryessa to Downtown San Jose. Proponents of the single bore argued that it would greatly minimize disruption to Downtown businesses as it would avoid gutting all of Santa Clara Street. It would also cut the construction timeline by as much as a year. 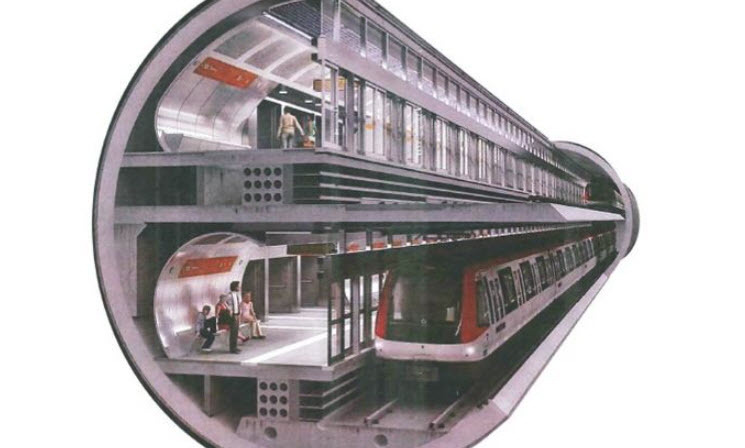 On the other hand, this type of subway has never been built in the United States and would not be consistent with the rest of the BART system. In the end, VTA staff has officially recommended single bore. The $4.7 billion tunnel will have a diameter of 47 feet, enough to accommodate two lines stacked on top of one another (see image below). This also means that all of the stations will be on one side of the street. Two other important related decisions were also made. There a couple options for the Downtown Station: City Hall and on Market and 1st Street. By choosing single bore, VTA was able to select the more central Market/1st Street location without having to shut down the Light Rail line during construction. The second decision was the alignment of the Diridon station. With single bore the station can be built right under Santa Clara Street with easier access to SAP, all without having to close the street down during construction.